Los Angeles is famous for its celebrity residents, beautiful weather, and incredible beaches, but it is also widely considered to be one of the best places in the world for boaters to experience a side of southern California that even many of its locals never see. Many visitors to Los Angeles make time to visit a beach or two during their stay. Another way to get to see that famous blue water, giving you the chance to admire the coast from a different vantage point is to go boating. It is easy to feel overwhelmed by the sheer number of beautiful places there are to go boating in Los Angeles, but there are a few true gems that are definitely worth a trip. 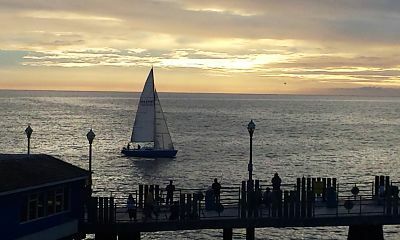 Redondo Beach is a spot that has just about everything you could hope to find in a beach town. King Harbor features four marinas where you will find slips, dockside ties, or hoists for your own personal craft, as well as plenty of boats for rent or charter. A popular fishing destination, you can go out for sport fishing, deep sea charters, and saltwater fly-fishing. If fishing is not your thing, there are a variety of scuba and kayaking opportunities. After a fun-filled day on the water, you will find a wide selection of shops and restaurants to visit. If you are an art lover, be sure to have someone direct you to see a local mural, one of Robert Wyland’s famous “Wyland Whaling Walls.” You can keep the kids entertained at the nearby SEA Laboratory, or Seaside Lagoon. Be sure to put back out to sea for the incredible sunsets! Carrying the distinction of being the largest man-made, small-craft marina in the world, Marina Del Rey is a haven for small boats. It is home to 19 marinas and over 6,000 recreational boat slips — which means plenty of space for you to tie up your boat or find a craft for rent or charter. Here you will find sport fishing, whale watching, and many other charter and cruising options. The waterfront boasts a tantalizing selection of restaurants for you to enjoy, as well as plenty of places to shop. You can also enjoy free weekend concerts that play at The Fisherman’s Village year-round. The beach area may not be as big as some of its more well-known counterparts, but its relative anonymity makes the ambiance a little less hectic and the crowds a bit more manageable. 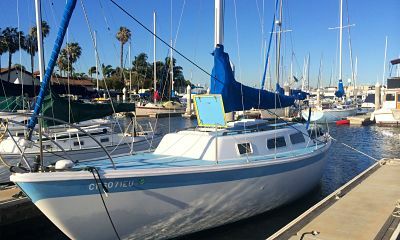 Ranked as the second busiest port in the United States, Long Beach Harbor is a great place to see many different types of watercraft in one place. The Rainbow Harbor/Rainbow Marina provides 87 slips and a dock reserved to accommodate day guests. It also provides 250 feet of guest mooring spaces at the outside entrance to the harbor. You can see the historic Queen Mary, and the views from the harbor of the Long Beach skyline are unparalleled. 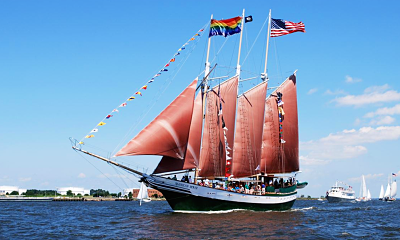 Keep a weather eye out for a schooner with tanbark sails, because it is likely the historic tall ship, American Pride. In addition to charter and rental boat opportunities, you will also find whale watching and dinner cruises, fishing and private charters, as well as boat rentals. Shoreline Village is a quaint place to walk around with many shops, bars, and restaurants for you to peruse, and is a popular destination for locals and tourists alike. The busiest container port in the Western hemisphere, the Los Angeles is the go-to place to see the maritime industry at work. Enormous container ships and cruise liners make their way up and down the channel and out to sea past the beautiful Los Angeles Harbor Lighthouse (known locally as “Angel’s Gate”). This port is home to two battleships, the S.S. Lane Victory and the U.S.S. Iowa, as well as twin brigantines, the Irving Johnson and Exy Johnson. The Downtown Harbor offers recreational courtesy docks (which are free for daytime use), and there are public landings available for small boats at Berth 84 and Berth 186. In addition, there is a public boat launch at Cabrillo Beach. The Ports o’ Call Village will satisfy your shopping and dining needs, and while walking around, check out the Los Angeles Maritime Museum. More often referred to as “Catalina Island” or simply “Catalina,” this 22-mile long island is still technically within the borders of Los Angeles County. What was once the playground of Hollywood stars of yesteryear is now a favorite destination for both tourists and native Angelinos. There are 400 moorings in Avalon Harbor, and more around the island. Many boaters sail or motor across from the mainland for fishing, parasailing, and snorkeling. Avalon is a picturesque town where you can hunt for trinkets or grab a bite to eat. The Catalina Casino is a historic landmark, and features a grand ballroom, movie theatre, and small museum. Two Harbors (the only other town on the island) hosts the “Buccaneer Days” festival every October, which is a pirate-themed weekend-long event that many boaters plan and prepare for all year. Just like neighborhoods on land, the plethora of Los Angeles boating locations each have their own individual personalities and attributes. Whether you prefer motor boats, sail boats, or if you want to be guided around by a professional skipper while you just sit back and relax, many of these locations can offer the boating adventure you seek. 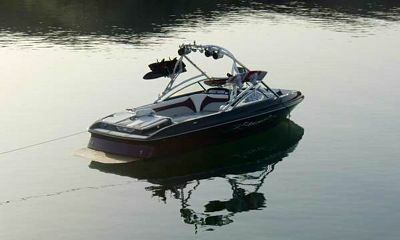 It if is time to get away from the beaches, jump on a boat and head into the sunset on a journey of your own choosing.